There are many different reasons why people choose to use exercise bikes. They are a great way to stay in shape or to increase your physical fitness. Many cyclists use them as training equipment when an event is planned for very early on in the season. An exercise bike is also a good alternative to people who enjoy cycling but enjoy the convenience and safety of indoor riding. Whatever your reason for looking into purchasing a new exercise bike, there are many different models to take into consideration, your decision is dependent on the specific use of what you wish to use your exercise bike for. There are training bikes, exercise bikes, and bikes created specifically for endurance. Know what your end goal is and keep this in mind when making your decision. To help you, we have put together a list of the 10 best exercise bikes for you to take a look at, all of which are current market leaders. The Exerpeutic exercise bike supports weights up to 300 pounds, an impressive 75 pounds above average. Mounting is easy, and the saddle provides great comfort. The seat has a large cushion and is adjustable in its height to suit users between heights of 5’3″ to 6’1″. The large LCD screen is easily visible making distances, calories burned, pulse, speed, and cycle times clear to see. Hand pulse sensors allow the heart rate of the user to be monitored during cycling. The high torque cranking system enables the rider to undergo a consistently smooth pedaling motion throughout. To be used on solid floors, compact design aids storage purposes. Move this bike from one location to another with ease with its transportation wheels. With eight different tension levels on a magnetic control system, this exercise bike caters for riders requiring all manner of difficulties and is quiet no matter what it’s setting. Why We Liked It – We like the Exerpeutic Folding Exercise Bike because it is substantial and caters for larger people in a comfortable manner, functioning quietly, recording measurements and storing easily when not in use. 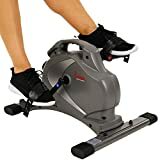 Ideal for a full cardio workout, consider the Marcy Club Revolution indoor bike trainer providing an intense workout, this durable, steel bike is ideal for indoor use. It is both rust and corrosion resistant and has been powder coat finish. Its seat has been ergonomically designed providing the ultimate comfort and ease of use. 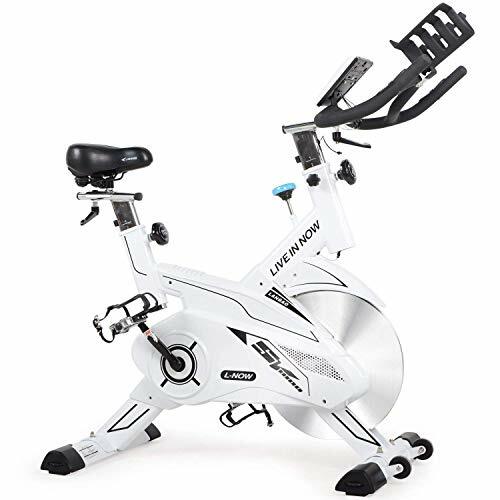 Styled on a road bike’s saddle for continuity, this exercise bike also has padded handlebars with rubber foam enhancing comfort and has an adjustable seat so that you can be position perfectly. Innovated to withstand 300 pounds even when a rider of this weight is in an upright exercise bike, with a standing posture. It has a quick-stop mechanism, allowing the bike to halt immediately. 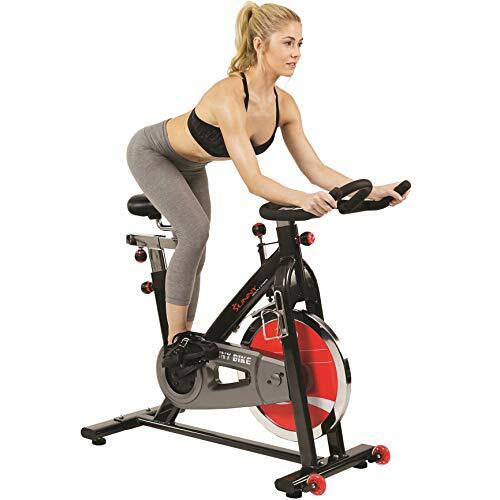 If you are looking for an exercise bike which is comfortable, reliable and sturdy which also gives you an intense workout with increasable resistance and the convenience of it always being available for your use within your home, look no further. 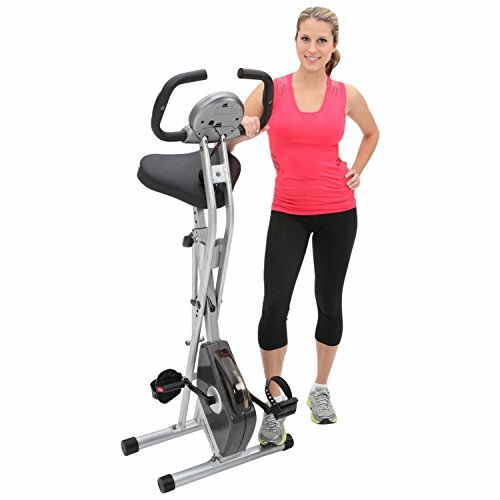 Why We Liked It – We like the Marcy Club Revolution Bike Cycle Trainer because of its high quality, supporting users of increased weight to undertake a safe and stable cardio workout from within their own home. 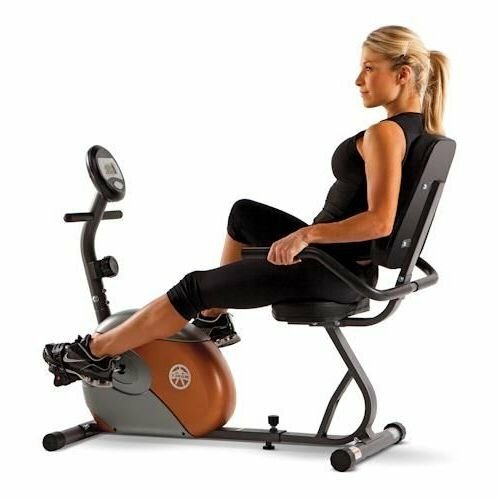 If seated cycling is more appealing to you, then the Marcy Recumbent Exercise Bike could be ideal. It has a step-through design, has been made in a sturdy manner and constructed from steel. It has 14 gauges and can easily be accessed. Great for cyclists suffering from knee or back problems, it allows maximum mobility while in the best position for problem areas. It has eight varying resistance levels created on a magnetic mechanism which can be combined with the use of the tension knobs to replicate outdoor riding. With the clever LCD screen, see the odometer, speed, distance traveled and calories burned. An ergonomically designed, padded, an ultra comfortable seat has been packed with high-density foam which contours to support all areas of the body. Use the padded handles for grip. For increased foot support, the pedals have been counterbalanced to give you maximum control. Use the foot straps to fit the pedals perfectly to your feet ensuring safety at all times. Why We Liked It – We like the Marcy Recumbent Exercise Bike because it enables people with knee or back difficulties to increase their fitness, lose weight or expand their muscle mass while being fully supported. 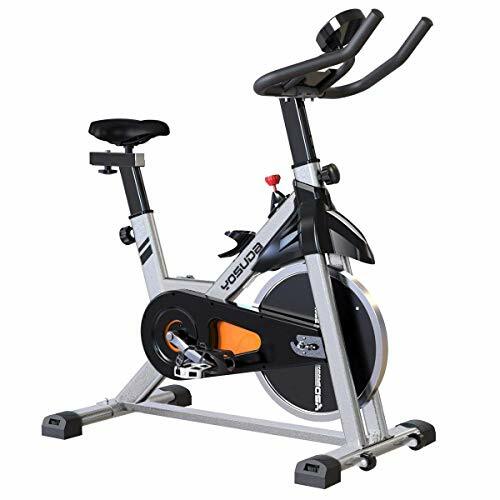 This visually striking Yosuda stationary bike is belt driven while remaining quiet and smooth, with a 35-pound flywheel fitted to a heavy duty, durable and reliable steel frame. It has an adjustable non-slip, easy grip handlebar, and its comfortable padded seat adaptable to four positions. Alter resistance to enhance your workout and simulate riding outdoors. It has an LCD monitor to help you track your advancement and a bracket for you to mount your iPad on so that you can listen to your music while you cycle. This exercise bike supports up to 270 pounds, has anti-skid pedals for increased safety, an emergency brake, wheels to help the user to manoeuver it into a designated position and a water bottle holder, so that hydration levels are kept high. The Yosuda bike is really easy to assemble so you can be cycling your way to the new you in no time. Why We Liked It – We like the YOSUDA Indoor Cycling Bike Stationary because it enables you to personalize your exercise bike experience so unique to you, your circumstances, your body, and your end goals. A solid, heavy duty, steel framed exercise bike with a 40-pound flywheel, driven by a belt. 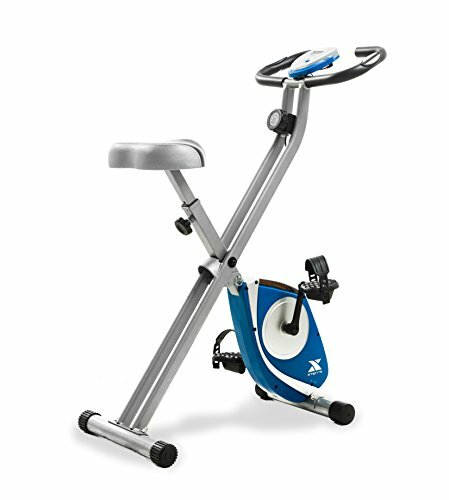 It is a very stable exercise bike, offering a smooth, quiet and powerful ride. It has a sensor to constantly measure the heart rate of the user and an elbow tray to increase the support and comfort of the indoor riding experience. Ride this exercise bike in the horizontal or vertical position, altering its saddle and handlebars to suit you and your workout. Its state of the art resistance system helps you to achieve the results you are looking for without the inconvenience of having to leave your home. This is a very effective bike for achieving high-intensity cardiovascular results. 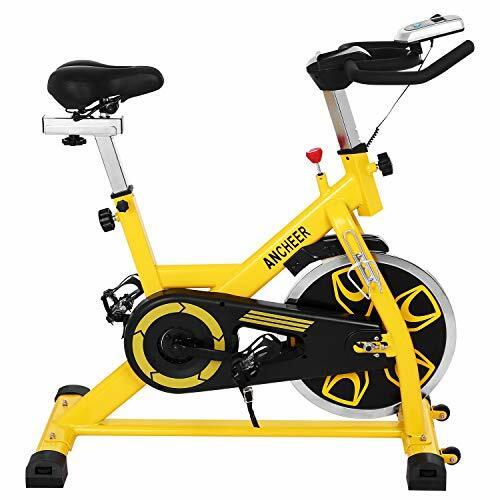 If you have uneven floors in your house, the Ancheer stationary bike has adjustable feet so that it is well balanced and safe on any floor, easily moveable to other areas through the use of its wheels. 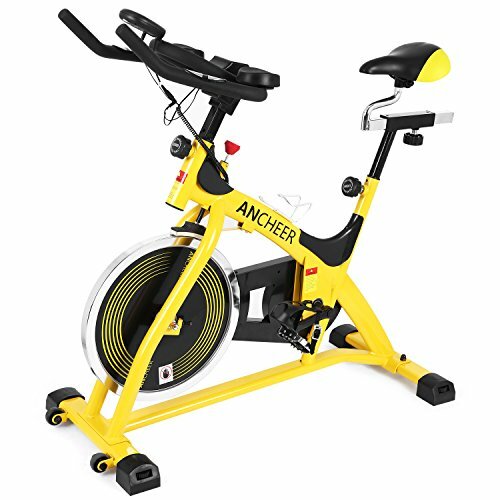 Why We Liked It – We like the ANCHEER Stationary Bike A5001 because it offers such an intense cardiovascular workout showing incredible results in relatively short periods of time, be it fitness, muscle or weight loss related. This is a very low maintenance bike. It’s comfortable, has adjustable saddle and handlebars, and is accessible to any height of the rider. It has an automotive-grade and is driven by a patented belt system, so it always offers you a smooth, quiet and easy ride. The bi-directional flywheel and steel frame make it the perfect solution for a rider who requires a more challenging cycling experience. It has an impressive LCD display which constantly monitors your progress and a stand to hold your chosen form of multimedia, like your phone, tablet or iPad, enabling you to multitask as you ride. For cyclists riding for long periods of time, the microfiber handlebars extend the length of time you are able to grip for and use the water bottle holder to keep well hydrated. Use its transportation wheels to move it into its required location and level it to keep safety paramount. Why We Liked It – We like the NOW Indoor Cycling Bike Trainer because it has been designed with comfort in mind for cyclists who spend longer periods of time on their bike or are training. Looking for an inertia-enhanced flywheel, belt driven indoor exercise bike? If so, this could be the indoor exercise bike that you have been searching for. This Ancheer bike gives the feeling that you are riding outdoors. It’s quiet, smooth and you will feel its effects as soon as you have completed your first workout. Increase or decrease its resistance to adapt the workout intensity to you and be reassured knowing that this bike has a quick-stop braking system should you need it. With non-slip handlebars, non-slip pedals, and toe cages, comfort, safety, and reassurance have been kept paramount throughout the creation of this bike. Adjust the seat to your exact height with ease and change its distance from the handlebars to find the desired position helping you to ride for hours in comfort and style. If there are multiple people in your home who cycle, this is a great adjustable option. Why We Liked It – We like the ANCHEER Indoor Cycling Bike because of how well it replicates an outdoor bike and because of all of its safety features to protect you as you cycle at home. Silver, slim and sleek – the Xterra folds up so that you are never negotiating floor space within your home, you’re never falling over it, and it’s never getting in your way. Its x-frame is solid, it has an anatomically designed seat, and its handlebars are well padded for maximum grip purposes. It has a small but easy to read LCD window display so that you can clearly see important information such as speed, ride time, distance cycled, calories burned, and your pulse rate. Increase the durability of this exercise bike by using the 3 piece pedal crank. With eight different resistance levels and a tension knob dial, this is a great exercise bike for any user of any age and fitness. The Xterra fitness bike folds up in such a compact manner that it can easily be stored in the averagely sized wardrobe when not in use. Why We Liked It – We like the XTERRA Fitness FB150 Exercise Bike because of how accessible it is for those limited on floor space with its compact design, durability, and easy ability to store. 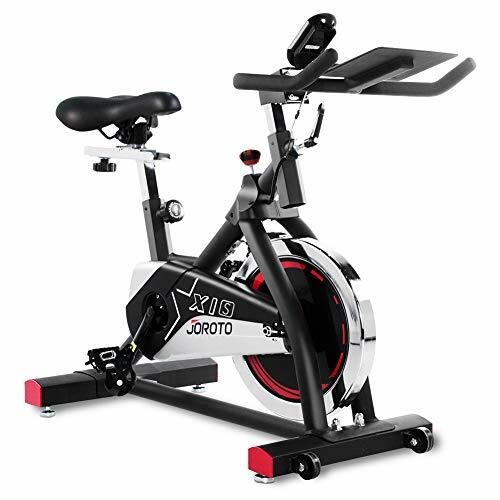 For cardio workout replication, the Joroto indoor cycling bike trainer is a great option. With its AV frame, 35-pound flywheel and 50mm thickened frame, it’s a solid choice for users up to the weight of 280 pounds. It has adjustable handlebars and seat making it suitable for any height of cyclist. Alter the resistance and workout intensity to enhance your personal workout. The inset digital monitor is easy to read, displaying all of the important information you require during your workout and can hold a tablet of 10″ so that you can listen to motivational music or join online spin classes. Use the wheels to move it to wherever you want to cycle within your home and replace the pedals with any pedals of 9/16″ if necessary. Request a Joroto indoor exercise bike with a wider seat if you think that would enhance your comfort and prevent cycling avoidance tactics. Why We Liked It – We like the JOROTO Indoor Cycling Bike Trainer because of how successfully it provides the user with a full body cardio workout and for its optional wider seat availability. For a real road feeling, the Sunny Health and Fitness exercise bike replicates the outdoors well giving you more realistic cycling feeling that perhaps you miss when the weather is unsuitable for cycling outdoors or if you simply do not have the time. Increase the resistance for a harder workout so that you can burn more calories, build more muscle and get fitter quicker. It has a solid steel frame supporting users of up to 275 pounds in weight. Maintenance is not required as this is a belt drive system bike, so it is smooth and quiet to ride, as well as requiring little attention. Alter the seat and the handlebars so that they are perfect for your cycling position and use the water bottle holder to remain hydrated while you workout at high intensity. With in-built toe cages, you will safely ride yourself to your fitness dreams. Why We Liked It – We like the Sunny Health & Fitness SF-B1002 Indoor Cycle Bike because it gives such an intense workout while offering a very similar feeling to that of a road bike. Know your weight and research as to the maximum weight of the exercise bike. Buying a bike, you are too heavy for will break the bike which you will not be refunded for and will be an expensive mistake to make. Many different weights are catered for, and some indoor exercise bikes are even created to help with weight loss if that is your main aim. If you are overweight and want to take up indoor cycling to decrease your weight, then you should also consider a seated exercise bike so that the pressure and impact are taken off your knees, hips, and back. Be clear before you start looking into different exercise bikes as to what your end goal is that you want to achieve. Are you wanting to lose weight, get fitter or increase muscle? The majority of exercise bikes are useful for any of these aspects and many more, but if you are wanting to do intense training for example, then you need to look for an exercise bike which has higher levels of resistance. This will help you to increase your fitness, muscle, and endurance, all of which you will be required to have in abundance if you are to complete a challenging road race successfully. Your height must be considered before you buy a new indoor exercise bike. Most exercise bikes are ideally suited for people between 5′ 3″ and 6′ 1″ but it is always best to check. It would be infuriating to have your new exercise bike delivered and spend the time setting it up, only to discover that you either aren’t tall enough to reach the pedals or are so tall that you are in a crumpled, uncomfortable position and left unable to cycle. Have a think as to where in your house you may be able to use your exercise bike. Take note of how level the floors are and take a look at the available bikes. Most exercise bikes do not have a leveler, but there are bikes available that do if you have uneven floors. This is more common in older houses. Levelers enable you to change the different heights of each point of the bike that touches the ground so that you are stable, safe and secure when you are cycling at home. For many people, cycling – indoor or outdoor – is a method of escapism. They want to switch off from the noise of daily life. If this is the case for you as well, then take the noise of your new exercise bike to be into consideration. Belt driven exercise bikes tend to be much quieter than friction trainers. Most of the newer models of exercise bike are pretty quiet though with generally the only things you’ll be able to hear being the fan and the gears as you change them. Why is the flooring type mentioned frequently when discussing exercise bikes? The type of flooring in your home is mentioned frequently in relation to exercise bikes because they require a stable base for them to be safe for use. If they wobble on an uneven floor, they will become increasingly at risk from falling over when the intensity, resistance and speed increase of the cyclist. To avoid accidents, injuries and costly damage, you can either change the place you are choosing to cycle into a floor that is more even or find an exercise bike which has in-built levelers so that it is completely stable for you to ride with reassurance. No matter what the age of your home or the type of flooring, looking for an exercise bike with levelers is always a good idea. What is the point of purchasing a seated exercise bike? Many people choose to use a seated exercise bike either due to their age, mobility or due to an injury. A seated exercise bike takes the pressure of the knee and hip joints, as well as the spine. This can also be very helpful to people who are overweight and are wanting to do an activity without putting their joints at risk but who want to find a way to burn calories and fat. How do I stay motivated when cycling for long periods of time? When long cycling periods are endured, it is difficult to keep motivated and focused, especially if you are at home and do not have a personal trainer keeping you going or a gym buddy to chat to along the way. If this is something you struggle with, you could consider finding a new exercise bike that has a holder for your phone, tablet or iPad. This will enable you to listen to music, audiobooks or podcasts while your cycle. You can also use your tablet or iPad to link into online fitness classes where a personal trainer motivates you to continue on your journey, be it weight loss, endurance or long distance training. This also helps you to communicate with other people across the country and even the world who have a similar end goal as you. You could then contact each other, motivate and spur each other on to help achieve your final dream and keep each other training until you get there.